DBS Private Bank’s Jason Low says S-Reits warrant a place in the average investor’s diversified portfolio. Ms Chung Shaw Bee of UOB notes the S-Reit Index clocked a five-year annualised total return of 13.1 per cent versus the STI’s meagre 4.9 per cent. 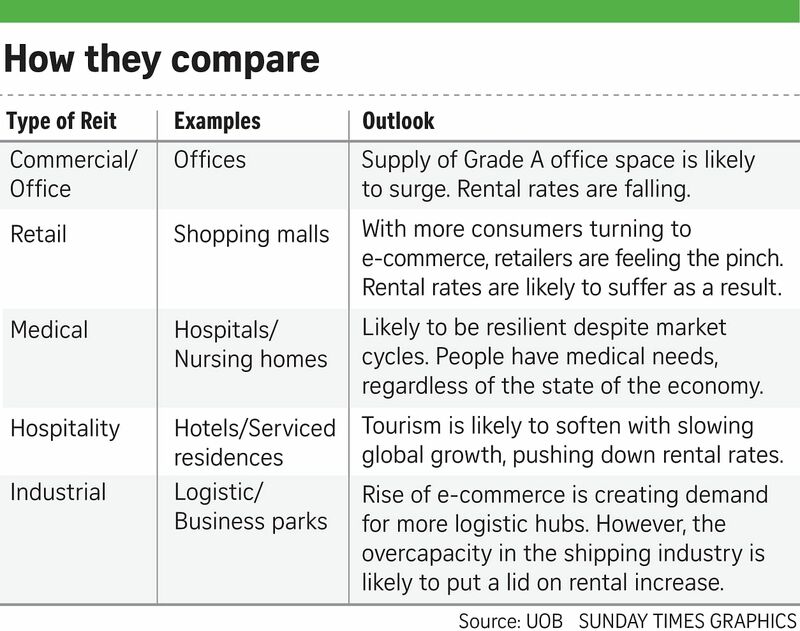 OCBC’s Andy Wong points out that S-Reits are not immune to the vagaries in the macro economy. Mr Jeffrey Lee of Phillip Capital Management says Reits benefit from low interest rates as valuations become more attractive. Real estate investment trusts (Reits) continue to occupy a sweet spot in the portfolios of retail investors who are hungry for yields and grateful for stable dividends. Since the first Reit - CapitaLand Mall Trust - was listed here in 2002, the Singapore Reit (S-Reit) market has grown rapidly. In all, 38 Reits and property trusts are listed on the Singapore Exchange (SGX), with a combined market capitalisation of about $72 billion. Three of the mainboard's six initial public offerings this year have been Reits - as well as one new Reit ETF listing. The S-Reit industry - comprising Reits with portfolios of retail, office and industrial rental space - now ranks third in size in the region, behind Japan and Australia. In a nutshell, a Reit offers investors a hybrid between a stock and a bond. Reits own a portfolio of properties and get income from rentals, then make regular payments to investors - similar to dividends. As Reit managers typically lock in rental leases with their tenants for a period of time, this provides a defensive element to Reits' income streams. However, potential risks include default by tenants on rental payment and non-renewal of leases upon expiry. MR ANDY WONG, investment analyst at OCBC Investment Research. 7 % The average yearly dividend yield for the 38 S-Reits, according to OCBC Investment Research. 38 Number of Reits and property trusts listed on the Singapore Exchange. $72b Combined market capitalisation of the 38 Reits and property trusts listed on the Singapore Exchange. Reits appeal to investors who are looking for stable returns. Though S-Reit returns have fallen from their heady levels of 10 to 12 per cent in the early years, Reits remain attractive, stable investments. This is because investors are generally confident that they are putting their money in a sector with strong and growing fundamentals, specifically rent and occupancy. According to OCBC Investment Research, the average dividend yield for the 38 S-Reits is about 7 per cent a year. However, investors should realise that various sub-segments within the S-Reit space offer different yields. Why Reits are attractive Mr Jason Low, an investment strategist at DBS Private Bank, says: "In today's volatile markets and low interest rate environment, S-Reits warrant a place in an average investor's diversified portfolio, given its lower beta (volatility) and high dividend yield." He adds that the sector has done "very well" this year and outperformed the broader Straits Times Index (STI). Still, DBS Private Bank takes a more selective stance on the sector, and Mr Low says it prefers Reits in the office and hospitality space where more value can be found. Ms Chung Shaw Bee, regional and Singapore head of wealth management at UOB, says: "On the returns front, Singapore Reits have outshone equities this year, boasting a year-to-date total return of 13.8 per cent, while STI stocks achieved a total return of only just 1 per cent. "Furthermore, the S-Reit Index clocked a five-year annualised total return of 13.1 per cent versus the STI's meagre 4.9 per cent." She advises that as the current low-yield environment is expected to persist, investors may consider investing in S-Reits for their good risk-return trade-off relative to equities, if their risk profile allows for this approach. Another plus factor is that Reits enable investors to take part in the real estate market without being tied to single assets. This reduces concentration risks for the investors, Ms Chung adds. Mr Andy Wong, investment analyst at OCBC Investment Research, believes S-Reits provide a good investment proposition, given their defensive attributes. But he points out that they are not immune to the vagaries in the macro economy. He says the benefits of investing in S-Reits include having exposure to a diversified portfolio of assets which are professionally managed, regular payouts of distributions and tax transparency. The locked-in leases of properties under Reits provide predictability and cash flow certainty. "As Reit managers typically lock in rental leases with their tenants for a period of time, this provides a defensive element to Reits' income streams. However, potential risks include default by tenants on rental payment and non-renewal of leases upon expiry," adds Mr Wong. Mr Jeffrey Lee, Phillip Capital Management's chief investment officer, notes that using low interest rates to support a weak economy has been a mainstay of global policy in the last few years. "Reits benefit from low interest rates as valuations become more attractive and high-dividend instruments will be attractive to investors," he says. Mr Wong says OCBC's preferred picks within the S-Reits sector are: Frasers Centrepoint Trust (target price of $2.33), Keppel DC Reit ($1.35), Ascendas Reit ($2.67), SPH Reit ($1.05) and Mapletree Greater China Commercial Trust ($1.15). Most investors tend to use the dividend yield as the main measure of a Reit's success - so the higher the yield, the better is the Reit, or so they believe. Another common qualitative measure is the price-to-book ratio which measures the share price as a ratio of the Rebook value (the lower the better). However, Mr Lee points out that for some Reits, high yield is typically associated with poor asset quality and/or poor outlook. "We need to look at the potential growth going forward, that is, whether the dividend is likely to rise," he says. For instance, it is misleading to conclude that high dividend yield alone indicates a good Reit. You may find that the life of the asset, for example the leasehold period, may be very short, so it is not sustainable. This is why the newly-listed Asia-Pacific Reit ETF does not merely look at Reits that pay the highest dividend yield. Instead, it selects the larger and established Reits with the ability to pay dividends regardless of how well the economy is doing, adds Mr Lee. Reits are structured in such a way that their price is closely linked to the underlying value of the properties in their portfolios and the rent they can command. Given that Reits have to pay out 90 per cent of their taxable income each year, it is important to have a strong, high-quality portfolio of properties to ensure they are sustainable, notes Ms Chung. Other asset qualities to look out for include the age, specifications and location, says Mr Wong. Mr Wong says to look at the performance of the Reit manager in terms of distribution per unit (DPU) growth trends, performance of assets acquired, execution of growth strategies and capital management. Ms Chung notes that as there is much market speculation these days about real estate booms (or busts), a strong, experienced manager will be able to filter out the noise and make sound decisions regarding the Reit's portfolio. "In addition, the management team may be involved in initiatives that enhance the value of the properties. Hence, investors should look for managers with strong records in delivering on their commitments and who have been in the industry for a while," she says. A Reit with a good mix of tenants is less exposed to concentrated and idiosyncratic risks. For instance, a Reit with a large proportion of tenants connected to the electronics industry could be hit by poor electronics sales. In the case of retail Reits, a good mix of tenants is essential to attract crowds and encourage spending. While capital appreciation should not be a priority of Reits investors (remember Reits have to distribute almost all of their income), it is important to consider whether there are projects in the pipeline for the Reit's properties. Ms Chung says upgrading projects can enhance the attractiveness of the property, help to maintain its competitiveness in the market and ensure stable income. Ultimately, investing is about value. Investors should compare the risk and yield of Reits to select one with the best risk-return trade-off, instead of simply choosing the Reit with the highest yield, Ms Chung adds. It is prudent to consider the gearing ratio of a Reit - that is, the level of its debt. This is because Reits which are highly leveraged may have a higher risk of carrying out equity fund-raising exercises, says Mr Wong. Mr Low notes that the gearing of S-Reits is "stable" at around 35 per cent now. Also look at the hedging strategies deployed for a Reit's foreign exchange and interest rate risks. Other income-generating investments To conclude, Ms Chung advises that aside from Reits, there are other investment vehicles which can generate passive income. "Unit trusts with a focus on income generation or cash bonds with high-quality names can also provide good cash flow. Investors can combine these different income sources to generate a stable income stream," she says. • Editor's note: Send your feedback to lornatan@sph.com.sg on what you enjoy reading in Sunday Invest. Tell me what else you would like to see in this section.